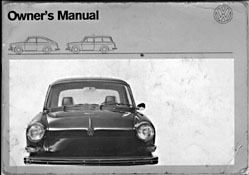 Welcome to the new home of The VW Type III Owner's Manual! Just what is a Type III, anyway? Park your ride in the shade, snuggle in behind the 25+ year old steering wheel, and carefully thumb your way through the manual's dog-eared pages. Leave room for other folks to pull up... you're visitor number since October 9, 1995.